Rexall Drugstore Canada Coupons: Bonus 80 Air Miles When You Spend $50 on Almost Everything + Flyers Deals! Rexall Pharma Plus Canada Drugstore has a new exclusive Air Miles coupon for 4 days only! 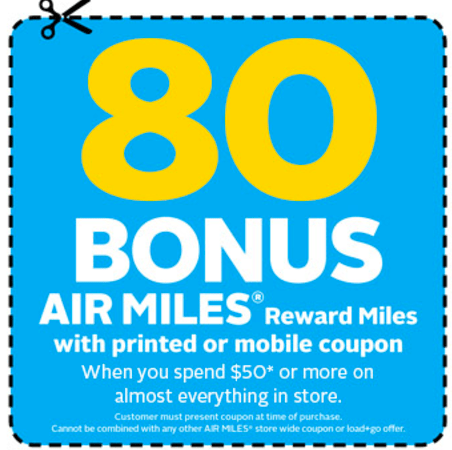 Get 80 Bonus Air Miles when you spend $50 or more on almost everything in store. The Rexall coupon is valid in-store from today, Monday, February 13, 2017 until Thursday, February 16, 2017 only. To get your Rexall Pharma Plus bonus Air Miles, print or show your coupon on your smartphone. Click here to view Rexall Canada flyers. Click here to get Rexall Canada coupon.